ARLINGTON, VA—Training cashiers or hanging a “We Card” sign in the window isn’t the only thing retailers need to do to truly prevent tobacco or other age-restricted product sales to minors. Governors from 38 states have issued Governor’s Proclamations or Letters of Support for We Card Awareness Month. Those states include: Alabama, Arizona, Arkansas, Colorado, Delaware, Georgia, Idaho, Illinois, Indiana, Iowa, Louisiana, Maine, Maryland, Michigan, Mississippi, Missouri, Montana, Nebraska, Nevada, New Jersey, New Mexico, North Carolina, North Dakota, Ohio, Oregon, Pennsylvania, Rhode Island, South Carolina, South Dakota, Tennessee, Texas, Utah, Vermont, Virginia, Washington, West Virginia, Wisconsin, and Wyoming. More Governors are expected to issue Proclamations throughout September. “Knowing what the law requires or posting the iconic yellow and red We Card signage throughout a store isn’t enough,” said Doug Anderson, president of The We Card Program. “Just like any other business, employees need tools and job aids to execute their tasks and responsibilities,” said Anderson. Tools like We Card’s age-of-purchase calendar and programmed cash register age prompts help employees calculate a customer’s age to help avoid mistakes during peak hours or when there’s an inattentive moment for the cashier. “We Card is a tremendous resource for retailers who fully embrace their role in spotting and denying underage customers’ attempts to purchase tobacco and vaping products. It’s a top priority for convenience stores and why our support of the We Card Program as a founding board member in 1995 continues so strongly today,” said Lyle Beckwith, Senior Vice President of Government Relations for the National Association of Convenience Stores. Throughout all of September’s We Card Awareness Month and right up until New Year’s Eve, We Card will be rapidly taking retailers’ orders for 2018 We Card materials. Retailers rely on We Card’s Age-of-Purchase Calendar – a daily reminder age calculation tool – and a variety of other point-of-sale tools, eLearning training courses and ID Check-Up mystery shopping services to help employees prevent tobacco sales to minors. Helping retailers successfully prevent e-vapor sales to minors is also a principal focus for We Card. In addition to state law requirements that require retailers to deny sales of those products to minors, in 2016 FDA started its regulation of e-cigarette and vaping products. In FFY 2017 the FDA has conducted nearly 100,000 store inspections using minors to check if retailers are asking for ID and denying minors’ attempts to purchase tobacco and e-vapor products. Grocery and supermarket stores are also tuning up for We Card Awareness Month. 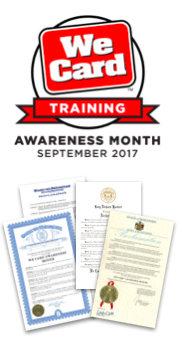 “Responsibly retailing age-restricted products like tobacco is an on-going effort, and for the nation’s independent supermarkets, We Card is an essential training and education resource,” said Peter Larkin, President and CEO of the National Grocers Association. NGA is a founding board member of We Card. FDA has issued official guidance for Tobacco Retailer Training Programs. We Card’s elearning training not only matches this federal curriculum but exceeds it with retail-focused emphasis on customer service, role-playing and interactive gaming – earning the training an American Business Awards 2013 Bronze Stevie® Award as a Best Training Site. About We Card: The We Card Program, Inc. is a national non-profit organization that represents a unified effort among trade associations, retailers, wholesalers and manufacturers. It was created 22 years ago to support retailers of tobacco and other age-restricted products. Individual retail establishments as well as large retail chains use We Card's educational and training services to comply with federal and state laws while working to prevent underage tobacco, e-vapor and other age-restricted product sales. National and state retail trade associations, government officials, community groups and others also support We Card's ongoing efforts to educate and train retailers.